To celebrate the holidays, we are going into the vault of previously released LE items and re-releasing some of our most popular items, with discounts of up to 50% off the original price. One item will be released every day, and they won’t stick around long, so be sure to keep checking back! Also, we’ve decked the halls of the Helicarrier to celebrate the season. Even S.H.I.E.L.D. loves the holidays. The third season of PVP Tournaments has been released. We have listened to player feedback about the end time of Tournaments, so this Tournament will end at 6 PM PST on January 7th. Hopefully this will give more people time to get home in order to participate in the crucial last moments of the tournament. Silver League - 100,000 silver! Gold League - 10 gold! Note that the names and text on some of these moves may not be finalized. We apologize that some of the improvements we intended to release with the last Tournament never made it in. By the time these features were ready to release, the tournament was too close to the end and we did not want to drastically influence the results with these improvements. We have many more improvements we would like to introduce to make PVP a more fun, balanced, and varied experience in future Tournaments, and will announce these changes as they are released. Tony Stark no longer owns locked PVP heroes, so they will no longer appear in his distress calls. The amount of Health and Stamina gained through PVP bonuses, either from heroes or from armory items, has been adjusted for this Tournament. Players will notice Health totals have been increased slightly. We feel that combats were too prone to characters being killed in a single hit, and this should allow players who wish to build for survival a viable option. Conversely, Stamina totals will be less than before. The issue is that even if the Stamina pool has increased, the cost for moves does not change. The generous amount of bonus Stamina from hero and armory bonuses has made Stamina cost for actions a non-issue in most cases in PVP. By making Stamina more of a scarce resource, we expect players to have to choose more carefully when choosing which weapons to use on their Agent, and to make the team Stamina restoration abilities of characters like Emma Frost and Mr. Fantastic have more meaning. Note that this only changes the extra stamina given from bonuses. A character’s base Stamina, and Stamina available in Missions and Spec Ops will not change. The way bonus values for the PVP armory has been changed. Now the amount of bonus that you get for a given armory value is based on your agent level. This will help players who are high level and not seeing much difference after placing items in their PVP armory. Players who are very low level may notice that their total stats in PVP go down slightly. In all, this should bring the amount of bonus players get from PVP in line with the amount of bonus granted by heroes. This also makes keeping an armory stocked with the latest items valuable to players of all levels. Note that these changes will affect a character’s total stats while in combat. The numeric bonus from armory items will not change. A player that had an offensive bonus of 20,000 before this patch will still have a bonus of 20,000. However, that player may have more or less Attack while in combat than they previously had. Players who take their heroes all the way will notice a substantial increase in the PVP bonus granted by extra high-level heroes. Heroes that are level 10, 11, and 12 will grant more PVP bonus than they used to. Level 10 heroes will give approximately 7% more bonus per hero, level 11 grant 19% more, and level 12 heroes grant a whopping 35% more bonus than they currently do. We plan to add some additional visual elements to make this more clear in our next patch. Train your heroes now and bring your team to new heights! There are changes to better communicate the new changes to PVP armory and hero bonuses, including tooltips to show how much a given offensive bonus contributes to stats and highlighting heroes that provide elite hero bonuses. These will be rolled out in a future patch Super Duper Soon™! 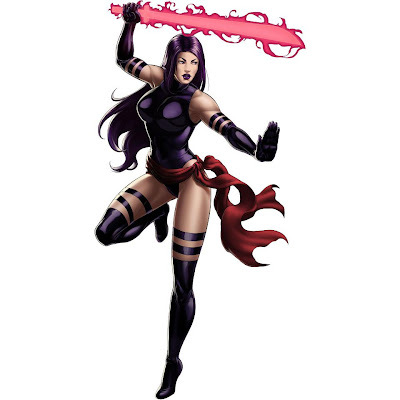 Psylocke: Kinetic Shield says Target Self, it's supposed to be Target Ally. Psylocke: Kinetic Shield does not injure the target of the buff. Present - A surprise debuff package for your favorite enemy!